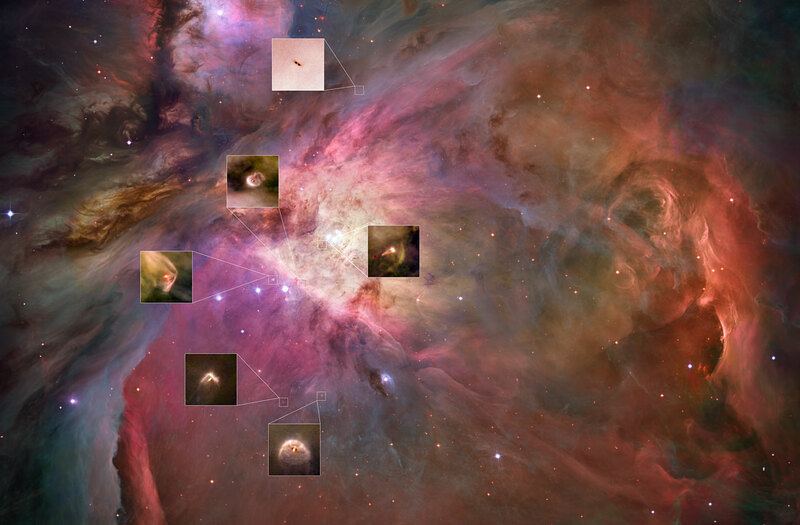 The gorgeous Orion Nebula is home to tens of what could be fledgling planetary systems. In this image, six of these modest "smudges" with big potential are highlighted (from top down): 132-1832, 206-446, 180-331, 106-417, 231-838 and 181-825. Within the awe-inspiring, gaseous folds of Orion, researchers have identified two different types of discs around young and forming stars: those that lie close to the brightest star in the cluster (Theta 1 Orionis C) and those farther away from it. This bright star heats up the gas in the nearby discs, causing them to shine brightly. The discs that are farther away do not receive enough of the energetic radiation from the star to set the gas ablaze; thus, they can only be detected as a dark silhouette against the background of the bright nebula, as the dust that surrounds these discs absorbs background visible light. In these silhouetted discs, astronomers are better able to study the properties of the dust grains that are thought to bind together and possibly form planets like our own. The brighter discs are indicated by a glowing cusp in the excited material and facing the bright star, but which we see at a random orientation within the nebula, so some appear edge on, and others face on, for instance. Other interesting features enhance the look of these captivating objects, such as emerging jets of matter and shock waves. The dramatic shock waves are formed when the stellar wind from the nearby massive star collides with the gas in the nebula, sculpting boomerang shapes or arrows or even, in the case of 181-825, a space jellyfish! Notes: The base image is from the WFI instrument aboard the ESO/MPG 2.2-metre telescope.